If a service is live streamed, then a secret passcode is created for access to the live stream which will start when the service starts. The passcode is given to a family member prior who can share it with any appropriate people who are unable to attend. 1. Too great a distance between family members. 2. Work or other unavoidable commitments. 3. Family members unable to travel for various reasons such as health or accessibility. One of the greatest concerns with a service such as webcasting is ensuring a high level of privacy and security. 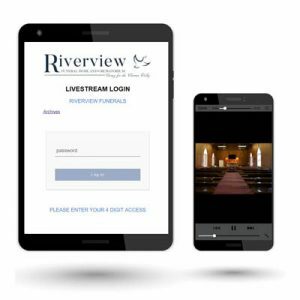 All Webcasts that are live-streamed in our chapels are protected by a unique pass code which ensures that only the selected participants of the live-stream are able to join. Services can also be recorded and archived for a period of time where they are accessible for playback using the same or different pass code. Alternatively the service can be recorded and placed on a USB or DVD. This service is free for both family who arrange the funeral and for viewers.